When I was a kid, my dad lost a bet to a buddy or maybe it was my Uncle Bud. I don't remember what it was they they bet upon, but I do remember that the loser had to shave his head and my dad was the one who lost. It was a shame. He had thick, wavy hair. But he shaved his head and, to add some extra flair, grew a handlebar mustache, because, hey, why not? Go big or go home, right? The thing is that in losing this bet, he discovered he liked having it shaved. So, every year after that on March 12 (his birthday), he'd shave his head for the summer and then start growing it back on Labor Day. We all teased him about it, but I think it amused him to be different. And you know what? Looking back, I think he was pretty awesome, because he taught me that it is way more fun to march to the beat of your own drum. Both my parents did. Neither of them ever did anything just because other people were doing it. They did their thing, spoke up when someone was being treated injustly, even if it wasn't popular, and were just decent, kind human beings. I love them for modeling that the best thing you can be in life is yourself. And so, today, I am grateful for my parents, because if you're a parent and raise your kids to be kind, to think beyond the tip of their own noses, to be proud of who they are, and to feel loved, then you've done your job. And mine did it in spades. 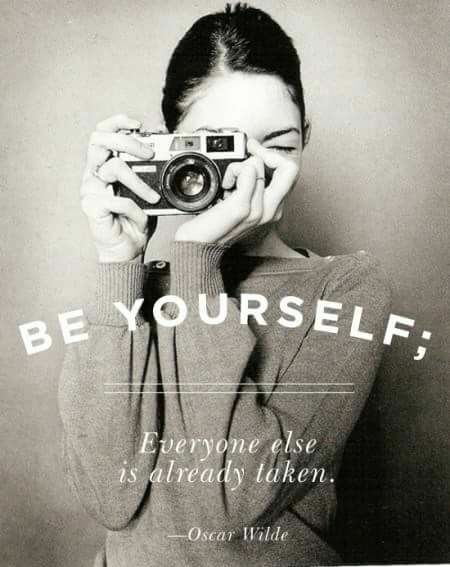 Who in your life has encouraged you to use your voice and just be yourself?